Tourist license number: Victoria City Center 1: HUTB-002265, Victoria City Center 2: HUTB- 002266, Victoria City Center 3: HUTB-007670. 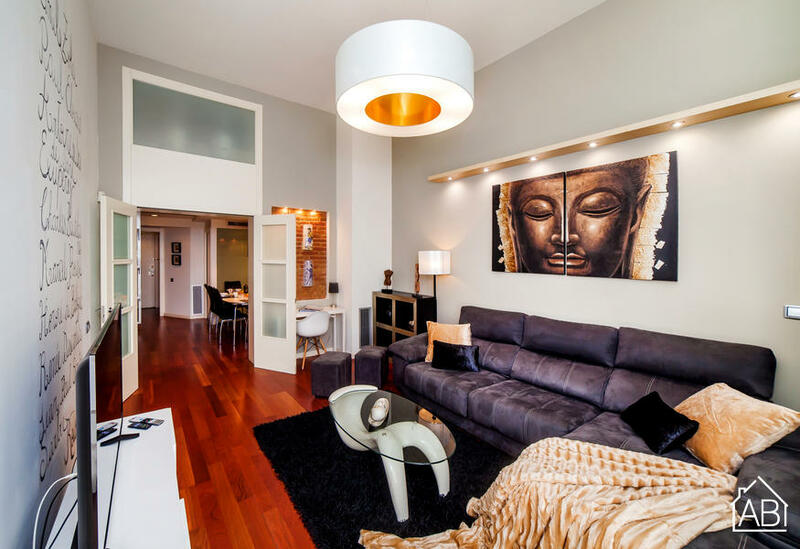 Luxury duplex apartment with 5 double bedrooms and 140 square meters at the heart of Barcelona, next to Plaza Catalunya corner Paseo de Gracia. You will have everything you might need within walking distance as well as the main attractions of the city. The location of this accommodation will make your visit to Barcelona easy and comfortable to plan. Among other major advantages is a few meters from one of the largest shopping centres throughout Barcelona: “El Corte Ingles” and 5 minutes walking from “Las Ramblas”. From the apartment, 5 minutes walking, you will be in the heart of the Gothic Quarter and El Born. A maze of squares all interconnected by narrow, medieval streets where there are a lot of trendy shops, bars, cafés and restaurants. With bars, clubs and hundreds of restaurants right on the apartment door, you do not need to go far to enjoy all that Barcelona has to offer. Near Paseo de Gracia Street, where you will find the most luxurious shops in the city and some of the most representative buildings of Catalan Modernism and Antoni Gaudí. This is a wonderful high standard apartment in a perfect location. An ideal choice for your visit to Barcelona. The apartment faces the interior of the block so that is both central and quiet away from the bustle of the street. Victoria City Center is a duplex apartment of high standing that has five bedrooms and two bathrooms. On the first floor there is a spacious lounge area with glass doors that give access to small balcony where you will find a table and chairs to enjoy the outdoors. The living room has plenty of natural light which makes it a great place to relax after a long day of sightseeing in Barcelona. Along the hall are the dining room and the fully equipped kitchen to prepare the best dishes and enjoy a good meal. At the end of the kitchen there is a small cleaning area with washer and dryer integrated with the kitchen furniture. On this floor the guest will find three bedrooms: the elegant master bedroom with double bed and walk-in closet and two double bedrooms with single beds. One of them has the access with a spiral staircase; this bedroom is not recommended for people with difficulty climbing stairs or for toddlers. A modern bathroom in white marble and glass completes the main floor. The apartment has WIFI, TV, DVD, central air conditioning and heating. All these, so that guests can enjoy their stay no matter the season. This apartment has no private parking. However, you will find a public car parking 250 meters away without difficulty. Important: The security deposit is 350 €. If it is required by Victoria Barcelona Properties will be charged upon arrival only by credit card. Informative notes: 1) Victoria City Center is inside Barcelona city in a residential area and the nightly rest of other neighbors must be respected 2) The adjacently building is on construction; nevertheless they always respect the legally established schedules 3) The property has a 200 liters hot water tank 4) The person who signs the contract upon arrival has to be older than 21 years. Please note: last minute reservations on this property must be done by 17:00, if you wish to enter the apartment on the same day. Reservations made after this time mean that guests must wait until the following day to enter.